Amphibians are unique group in the animal kingdom, they have porous skin! This permeable skin allows water and air to pass directly pass into their body without filtering through their stomach. While their permeable skin and soft eggs give amphibians an advantage to take in more oxygen, it also makes them more susceptible to pollutants. Amphibians therefore can serve as “canaries in the coal mine” for water quality. Biologists throughout the world are concerned about the health of amphibians because their health can be linked to the health of the environment they live in. Water pollutants, such as, road salts, pesticides, metals and other sources of runoff from agriculture and cities can have negative effects on overall health and reproduction of these critters. Water quality degradation has been linked to physical malformations in amphibians and may also reduce their ability to fight off pathogens, leading to reduced reproduction and mortality. These issues linked with water quality and amphibians may also have a larger implication of the health of the ecosystem, including human health. Therefore, it is important that populations of amphibians and other wildlife are carefully monitored and protected. In order to protect our water quality in and around our homes it is important to limit sidewalk salts, garden fertilizers and pesticides as much as possible. Make sure to follow label instructions and application rates. Amphibians are also beneficial as they eat insects, including agricultural pests and serve as food to other wildlife. They have also been an important role in research and medicine. Each day, consider taking small steps in your own house to help the amphibians that call the Garden State home. While human diseases such as Ebola and the zombie apocalypse virus have made recent headlines in the news and on our TV screens, there is a virus that is also affecting our local amphibian population. This emerging disease known as Ranavirus, has become increasingly common in the U.S., including New Jersey. This virus has been known to affect amphibians, reptiles and fish. It is of great concern because it can kill nearly 100% of amphibian larvae (tadpoles) within just a few days once a population is infected. Ranavirus causes skin ulcerations and organ hemorrhaging, and is especially threatening to larvae, specifically wood frogs (Lithobates sylvaticus). Transmission of the disease can be spread direct contact, waterborne exposure, contaminated soil, and ingestion of infected tissues. While the virus has been known to cause major die-offs all over the world, little information on the timing, extent, and frequency of the disease outbreaks is known in the Mid-Atlantic U.S.. In order to gain more information, a multi-state survey has been underway since 2013. The project is led by Scott Smith of the Maryland Department of Natural Resources. Conserve Wildlife Foundation staff biologists are doing a large amount of New Jersey’s field surveillance with support from the New Jersey Division of Fish and Wildlife Endangered and Nongame Species Program (ENSP). 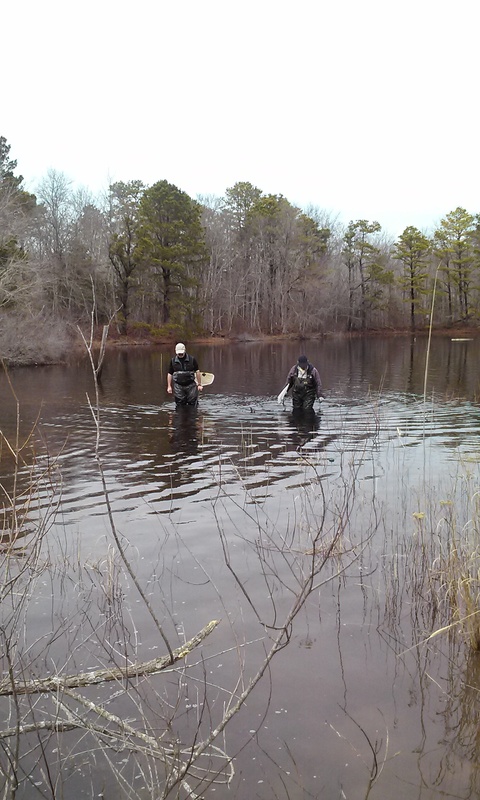 As part of this project, in 2013, breeding ponds throughout the New Jersey were sampled for prevalence of Ranavirus. Thirty larvae from each study pond were captured by dip net, physically examined, euthanized, and preserved for screening and other analyses at the labs of Montclair State University and/or the National Wildlife Health Center. Results determined that about half of these ponds tested positive for Ranavirus. In 2014, Ranavirus-positive sites were re-sampled for presence of the disease. 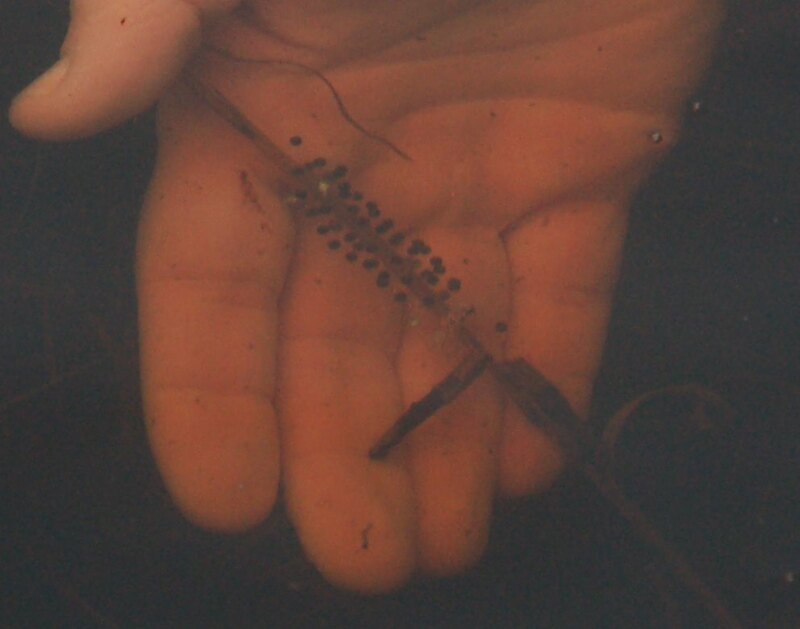 At about 25% of the sites, disease symptoms and/or dead tadpoles were found, though no mass die-offs were observed. Investigations are still ongoing to further determine the impact of Ranavirus on amphibian populations as well as potential environmental factors that may be associated with the disease. Remember back in late October of 2014 when word quickly spread about a new frog species in New Jersey? The Atlantic Coast leopard frog is mint-gray to light olive green with medium to dark spots. The frog has been found along the Delaware River and Bayshore, along Atlantic Ocean coastline, in the Meadowlands and on Staten Island. Although other leopard frog species, like the southern leopard frog and northern leopard frog, have been recognized and found in New Jersey’s wetlands for some time, researchers only recently gained the ability to use technology such as DNA and digital bioacoustic analysis to present thorough evidence that the Atlantic Coast leopard frog was a unique species. 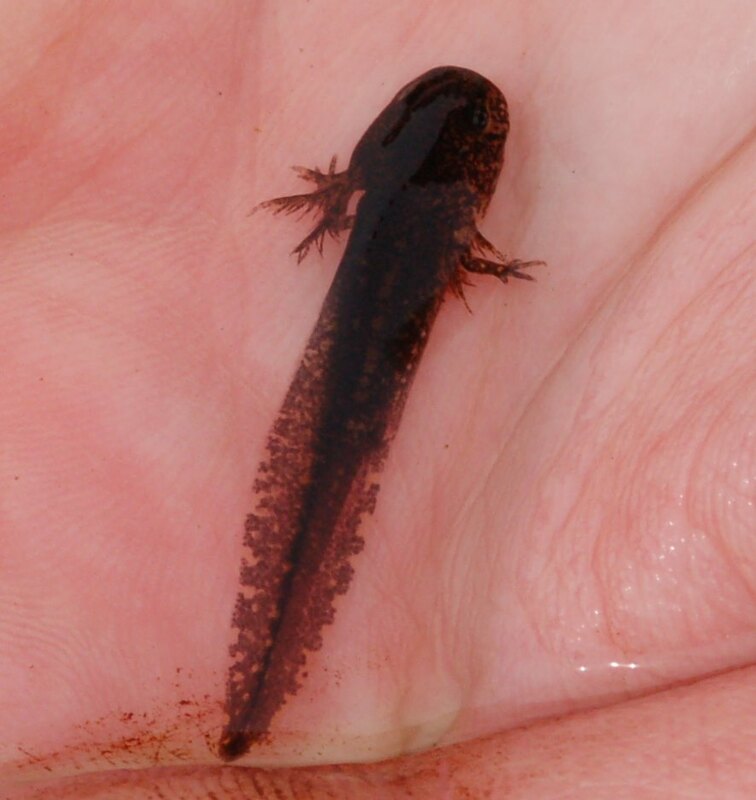 In March 2003, CWF Biologist Brian Zarate and other scientists volunteered to survey salamanders at the Great Swamp National Wildlife Refuge in Morris County, New Jersey. As the biologists gathered in the parking lot, they heard an unfamiliar sounding frog. The group captured the frog and took photos, reasoning that it wasn’t the common southern leopard frog, and that might be a northern leopard frog released into the wild. Zarate, now a zoologist with the state’s Division of Fish and Wildlife, moved on to other projects, but in 2007 he checked in on the strange frogs. He heard them near the same Great Swamp parking lot. He posted a video of the frog on YouTube. Four years later, the group returned to Great Swamp, and found the strange frog there and in several other places too. Through the partnership of Zarate, Jeremy Feinberg, a Rutgers doctoral candidate, and Eric Kiviat, a collaborator with Hudsonia Ltd., and the implementation of new technology, it was proven that the strange frog was indeed a different species of leopard frog, the Atlantic Coast leopard frog. Starting this spring, Endangered & Nongame Species Program biologists, including Zarate, will begin a two-year project mapping the potential range of the Atlantic Coast leopard frog. Biologists and volunteers alike will comb New Jersey’s wetlands in search of evidence of the frog and collect data on its habitat preferences. 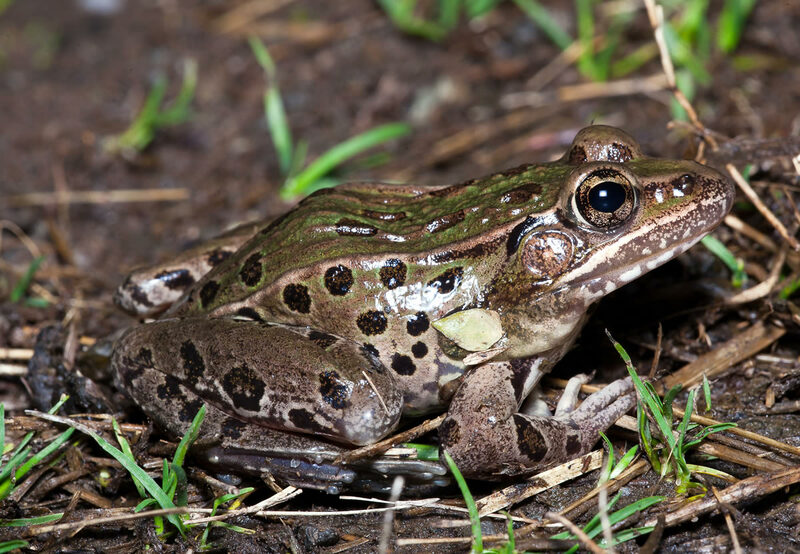 Looking to report a possible sighting of an Atlantic Coast Leopard Frog? Contact Brian Zarate at brian.zarate@dep.state.nj.us.